KUALA LUMPUR, 14 November 2013 – Misunderstood and often with no one to turn to, the underprivileged children of Chow Kit have long endured the negative stigma associated with the notoriety of the area. Coming from lower socio-economic backgrounds, often, these children are exposed to the negative activities that are prevalent in the surrounding areas. 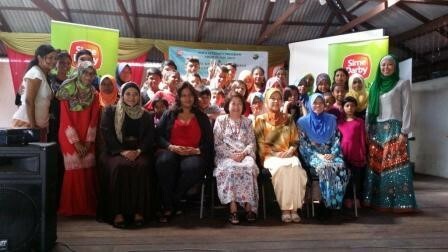 Sharing the common belief that intervention is the key to ensure these children do not grow up to turn to a life of vice, Yayasan Sime Darby (YSD) with Yayasan Chow Kit (YCK) jointly launched a counselling room for youths at KL Krash Pad. A total of 500 adolescents and young people under the age of 21 are registered with KL Krash Pad, 50 of whom are daily users and visitors to the centre. YCK will collaborate with PT (Pink Triangle) Foundation, a community-based organisation providing information, education and care services relating to HIV/AIDS and sexuality in Malaysia, which will provide trained volunteering counsellors to support this programme. The RM900,000 funding from YSD for three years covers YCK’s literacy programme, empowerment and capacity building programmes for YCK’s teachers and trainers, counselling services as well as motivational and life skills for children and youth. YSD Governing Council member Datin Paduka Zaitoon Dato’ Othman, in her speech, emphasised the importance of providing a supportive environment for underprivileged children, especially those in the Chow Kit area. Meanwhile, YCK founder Dr. Hartini Zainuddin said the launch of KL Krash Pad’s newly refurbished counselling room was made possible with the support of YSD, which has funded YCK since June 2011. “The collaborative effort between YCK and YSD is not about saving lives or rescuing any child at risk. Rather, the goal is about opportunities and second chances. The counselling support provided by YCK creates safe spaces for children to thrive and grow and make better decisions and choices in their lives,” said Dr. Hartini. The KL Krash Pad’s counselling room was launched during the YCK Excellence Award day, where a total of 27 children who participated in YCK’s home schooling and literacy programme were celebrated for their excellent academic achievements. The literacy programme is another initiative funded by YSD to provide educational support to foster the personal growth, development and academic excellence for underprivileged, undocumented and refugee children aged 7 to 12 within the Chow Kit area. YSD also supports other organisations and initiatives under its community development pillar such as the Cancer Research Initiatives Foundation (CARIF), Women's Aid Organisation (WAO), Tabung Leukemia YSD, the National Autism Society of Malaysia (NASOM), Malaysian Federation of the Deaf (MFD) and Malaysian AIDS Council (MAC), Tabung YSD for the underprivileged coronary patients in collaboration with the University Malaya Medical Centre, Hospis Malaysia and the Cancer Advocacy Society of Malaysia among others. In June 2012, YSD initiated its own first major community development programme called ‘Sinar Harapan YSD’, which aims to provide sustainable assistance to deserving charitable homes. YSD hopes to assist homes registered with the Welfare Department with physical assistance like upgrading their premises or enhancing their facilities. YSD also assists in providing transportation as well as help with capacity building via management empowerment and skills training to help them live better lives. The assistance is also extended to unregistered homes to help them meet requirements set by the Welfare Department and to be registered under the Care Centres Act 1993. So far, a total of 52 welfare homes have benefited from YSD’s in-kind and monetary contributions under this programme.